Red Skin Syndrome (RRS) is also known as Topical Steroid Addiction (TSA) or Topical Steroid Withdrawal (TSW). Red Skin Syndrome is a debilitating condition that can arise from the prolonged use or cessation of topical steroids (corticosteroids, glucocorticosteroids or cortisone) to treat a skin problem, such as eczema. Red Skin Syndrome is characterized by red, itchy, burning skin that can appear after ceasing topical steroid treatments. In Red Skin Syndrome, topical steroids are effective for a period of time to treat the skin condition, but as time passes, applying topical steroids results in less and less clearing. The original problem escalates as it spreads to other areas of the body. In the case of eczema, this 'progression' is often mistaken for worsening eczema. Red Skin Syndrome is an iatrogenic condition, which means it is a condition caused inadvertently by a medical treatment and proper management of the condition requires cessation of topical steroid treatment. After cessation: [a] Skin flushing bright red, resembling a sunburn, [b] flaking of skin – appears to be ‘snowing’, [c] oozing exudate, [d] skin cycling between oozing, swelling, burning and flaking, [e] red sleeves (arms/legs become red and inflamed, [f] thermoregulation altered (feeling too cold or too hot), [g] hypersensitivity of the skin to water, movement, moisturizer, fabrics, temperature, etc, [h] nerve pain, sometimes described as 'sparklers' or 'zingers', [i] enlarged lymph nodes, [j] edema, [k] eye dryness and irritation, [l] skin atrophy (often manifesting as 'elephant wrinkles'), [m] hair loss (head and/or body), [n] insomnia, altered body clock, [o] appetite changes, [p] fatigue and [q] emotional fluctuations, depression, anxiety. 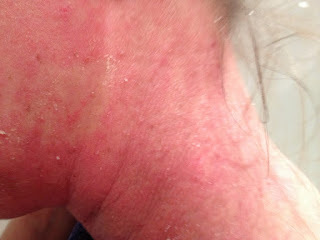 Read here how Red Skin Syndrome influenced the life of my dear friend, Elaine Thomson.